Pamukkale - As we approached from the southern entrance, we were shocked by the whiteness of the travertines here. As the day wore on and the sun came out in full force, I couldn’t help but be reminded of a favorite late '70s pop song called “Blinded by the light.” The hot sun reflected off the calcified stones, which later resulted in some spicy sunburns as well. I had seen many photos of Pamukkale online, but still I was amazed at this site - nothing like I have ever seen before. I’m sure it’s a natural wonder I’ll never see again. I'm thrilled we were able to share this experience with my husband's parents too. Mom and I pose for photos at Pamukkale. Unfortunately, the travertines used to be even more beautiful - as is evidenced in old photos found online or in books - and more were open to the public. However, years of neglect and too many tourists destroyed some of the travertines, which are now closed off and have reverted to an ugly gray color. You were forbidden to walk on this old section of the travertines. In 1988, the area of Pamukkale and the neighboring ancient city of Hierapolis was declared a World Heritage Site by UNESCO. From what I understand, the Turkish government later sought assistance; and in 2006, UNESCO stepped in to help restore the natural whiteness of the travertines. To maintain the travertines, the water flow now is controlled through select channels and reaches the terraces according to a weekly watering schedule. The water flow is now controlled through channels in the rock like this one. Walking barefoot on the calcified rocks, you may think you might slip, but you don’t. Because of the flowing waters, the rocks have rippled grooves in them. Hubby's foot in the cool waters at Pamukkale. We had an enjoyable experience in Pamukkale and absolutely loved our small hotel, the Melrose House Hotel. 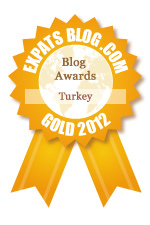 Here's that post: Pamukkale - Where to Stay - The Best Small Hotel. The landscape of Turkey continues to amaze me. This summer, we have a few more road trips in Turkey planned. Stay tuned! Tip: Arrive first thing in the morning so you can avoid some of the crowds. At the top located in Hierapolis, you'll find a few ancient sarcophagus embedded into the travertines. I highly recommend the site! One of our favorite sites so far! pamukkale hotels.I am living Denizli and it is near the Pamukkale. By visiting my site you can learn about pamukkale hotels. Teşekkürler, Murat! But I know about be returning to Denizli anytime soon since we now live in Poland.